Snooker “would not be sport” without betting sponsorship, says ex-world champion Stuart Bingham – but the level of promotion is a “nightmare”. Of the 20 ranking events, 11 are sponsored by betting companies, while other invitational events are also financed by them. Bingham, 42, who served a three-month ban for betting breaches last season, won the English Open last month. The situation is a “catch-22”, he told BBC Sport. “It is in our faces, it is everywhere,” he added. “Betting is in our game, lots of tournaments are sponsored by it, they have to put their banners out there. I don’t think you can stop it unless we get another load of companies which change the sponsorship. Bingham’s suspension last season excluded him from three of the most lucrative events on the calendar – the International Championship, UK Championship and the Masters. The world number 14 said the ban ruled him out of claiming £40,000 in guaranteed prize money, on top of the £20,000 he had to pay in costs, while estimating he missed out on “around £150,000-200,000” by not featuring in those events. Bingham faces Thailand’s James Wattana in the first round of the UK Championship on Wednesday, an event which is live across BBC TV, radio and online. “I didn’t watch the tournament last year,” Bingham said. “My wife said no. It is one of the only times I have listened to her. The Gambling Commission says there are 430,000 problem gamblers in the UK, while a report last week said 50,000 children aged 11 to 16 are classed as having a gambling problem. Last year, former Masters finalist Joe Perry and current world number 92 Alfie Burden – both in their 40s – received suspended bans for betting offences. Asked if players need educating more about the problems with gambling, Bingham said: “The WPBSA [World Professional Billiards and Snooker Association] are trying to. It is the older generation that have always done it. In a statement responding to Bingham’s quotes, World Snooker told BBC Sport: “We work with a range of fantastic sponsors on our tournaments. 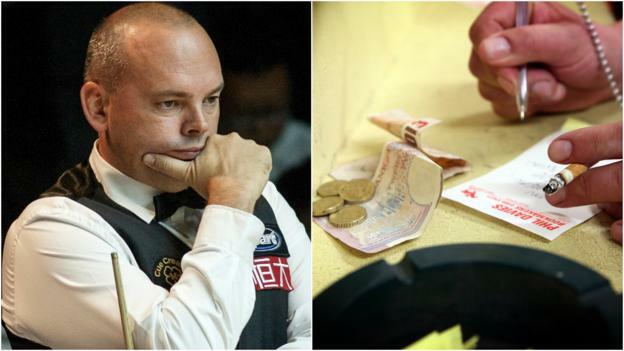 Bingham was banned after the governing body, the WPBSA, found him guilty of breaking rules on betting on matches involving himself and other players. But the Basildon player strenuously denied putting money on matches he was involved in, saying they were placed only by another person with whom he shared an account. When announcing his ban, the WPBSA also said the estimated total of his betting on snooker in the past seven years was £35,771. With his family in the arena, Bingham broke down in tears the after winning October’s English Open event in Crawley, securing the fifth ranking title of his career. Bingham, who won the sport’s biggest prize at the Crucible in 2015, said the emotions poured out after he received horrific abuse on social media following his ban. In August, world number six Barry Hawkins revealed screenshots of messages which told him “to die” following a loss at the World Open. Bingham said: “It has been a tough time off the table and the win at the English Open made it more special. It was nice to get back into the winners’ circle, to get my hands on the trophy meant the world to me. “My family and I got a lot of abuse on social media. People that did not know the full story and had just read the headline branded me a cheat. “I can say on my kids’ life that I have never missed a ball on purpose or thrown a game. My family, friends and those in snooker know I have never done anything like that. “The headlines that came out were a bit harsh but my friends and family know the truth and that is all that matters. It showed me a lot about people on tour who I thought were my friends. It opened my eyes to a lot more. “We had it with Barry Hawkins and I had a row with someone who had a £20 bet and he wants your kids to die of cancer. It is so bad.